Teachers Pay Teachers is an awesome online marketplace to Share, Buy, and Sell Original Teaching Resources and Ideas! I stumbled across Teachers Pay Teachers in 2012 while I had another couple over for dinner. My friend Kelly casually brought it up while we were trading teaching stories and I had no idea about the site, concept, or even the idea that it would become a huge part of my life at the time! The next morning as I calmly awoke from a peaceful night's rest with no loud children asking for breakfast at 6:15 a.m. I made my way to the kitchen and pulled out the laptop to investigate further into this Teachers Pay Teachers. The first step is making the commitment to start the adventure. My decision to open a store involved the fact that I could greatly help and guide other/novice teachers and more importantly positively impact even more students with top quality Health and Physical Education activities, lessons, and resources. Every time I make a sale (get the App so you can hear the money sound! ), I immediately wonder who is going to be impacted by what I have created. It drives me to know that I may only teach in one gym in New Jersey, however my ideas and resources are being brought to life in gyms throughout the world. I am thankful to all those that share and believe in the passion of physical activity, health, and ultimately helping others improve their quality of life. It all started with a deep breath, a few clicks, and a belief in something I felt strongly about. I would spend hours playing on the site. Searching, exploring, and reading forum posts. The notion that I could potentially make this a legitimate side hustle drove me to fully commit to the entire process. I learned how to navigate the pages, read as much information as I could, and finally began to find what successful sellers were doing with their brands, stores, and resources. It was easy to see and feel the difference between quality stores, but the question became how do I become like that? I started to follow sellers that I respected and admired in an out of my field. In essence, I did my homework and put in the time to get on the right path. "There is no elevator for success, you have to take the stairs." Mr. Clark's Physical Education Heart Homework! (Still a free download so grab a copy). Buyers slowly started downloading it and to date it has over 4,600+ downloads. I wonder how many hearts completed the assignment! The cover wasn't initially that eye-catching, and it was a simple word doc file that I wanted to share with the world. All I did was organize my thoughts into a file that I knew would provide value and posted it for anyone to download. ​​This lead to more followers and to even more motivation to keep building. I had found my door in, and now my goal became to make the doorway larger and always welcoming so that anyone and everyone to come through and share my passion. ​What will your door look like? My fire was lit, but I needed more wood to burn. I began to organize my thoughts, resources, and made lists and lists of what has brought me success in my teaching career. I used note cards, sheets of paper, and even the note app on my phone to keep track of new ideas. It lead to more and more resources uploaded to my store. I had 30 resources by the end of 2012! Fast forward to today and I have 514 and growing. Some were instant top-sellers and some still haven't been downloaded even one time. I guess you can say I have failed a lot while plugging away at this adventure! However, you can also say that I wouldn't let a few failures define me! No matter what I kept thinking, working, and creating. I continued to brainstorm new ideas (my absolute favorite part of this whole process). I found new applications (Comic Life-my go #1) to create covers and found even more ways to visually bring my work to life with little design/artistic ability. I wanted to have them stand out since I knew the simple fact that buyers will judge the cover of your book before they decide to open it. ​Over time my work has gotten significantly better and I continue to challenge myself to create the very best educational resources I can. ​I guarantee a lot of you have the potential, the skill set, and the experience to make this a reality just like I have! Earlier work. 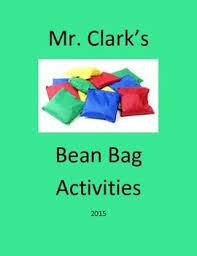 Great bean bag resource though! Let there be light and colors!! I am not a huge social media guy, however if I wanted to grow my store I knew that I would have to extend my reach. The first thing I created was Pinterest because I loved watching my wife pull up quick recipes for dinners we (she) would make. I also loved the visual component to it. I made PE specific boards and started to pin all of my resources that would link back to particular resources and my store. I also utilized already created boards, but looking back I was way off on how actually do it and I think I over pinned. It was definitely a learning experience and now I can pin like the best stay at home Mom or Dad! I then made my Twitter and Facebook pages because I read about the importance of having them on the TPT forums. I utilize Twitter to share knowledge I randomly gain and to share when I blog. Knowledge from fitness to finance to personal empowerment. Facebook is where I share my newest resources, when I have sales, and where I want to direct people to check out my latest blog posts. Lastly, in 2016 I started Mr. Clark's PE because I felt like I needed to get all this energy and knowledge out. I started building pages, adding meaningful content, and really growing into a website that people could trust and find useful. My goal was to connect educators to more than just content, but to help them with their own lives when it came to health, wealth, and personal empowerment. I absolutely love the notion that at any given time (even while I sleep) somebody in the world could be on my site, reflecting on my thoughts, and using them to better their own life! Talk about goosebumps! Once you have your brand, your content, and your purpose you can begin utilize the amazing tools, tricks, and resources to increase your success. Here are the tabs that I would suggest exploring and learning more about. You will find all of your most important information to access and that you will see changed/updated in various places throughout your store. Email Preferences- how often and what type of emails you would like to receive from TPT, sellers, and whenever you get feedback, questions or make sales. Read the Forum Posts for news regarding updates, sales, and changes to stay fresh on what's going on. Engage your followers (they will come over time) by sending them Monthly Notes letting them know about your new resources, promotions and sales you might be throwing. I love this feature because it allows me to highlight some new things I have been working on and I offer bonus information to those that want and choose to Follow Me! Respond within 24 hours (the sooner the better) to Questions and Ratings to show your audience you are punctual and respect their voice! Use their Feedback to get a pulse on your resources and to understand how to get better. Submit your free and paid resources for TPT Newsletter Promotions. This is a great way to get your store out there to the rest of the world. If you are lucky enough to get chosen, it could mean a lot more followers and a lot more engagement with your store! Throw Sales on your products. Mix up when and how you throw them so that it keeps your store fresh, but mysterious. It is also a great idea to throw 20% sales when there is a site-wide TPT sale (generally a few times a year). Build a Wish List of your favorite resources so they will save for you when you are ready to purchase. I would put a time limit (month or so) on this since it shows the seller how many people have wish listed their individual resources. Look at your My Purchases as a bookmark for all your free and purchased downloads and keep an eye out to see if sellers have updated or enhanced resources that you have previously purchased. My Favorite Sellers tab are the sellers you decided to follow so choose them wisely because every time they create a new resource you will be sent an email letting you know. Your Dashboard is the heartbeat to your store. It gives you a detailed chart on your sales, traffic, and earnings (with the ability for customization). It is also where you go to directly manage and upload resources that you want to share with the world! It is also acts your own bookkeeper that shows you Payouts, Sales and Earnings, and how much you paid on Paid Promotions. Sales Reports- this is where you can see what was purchased, who purchased it, when they purchased it, and the breakdown of how much was earned for TPT and for your store. It now also shows tax information by state with downloadable reports. Really awesome information to also see if they have purchased from you for the first time or many times. All this is right at your fingertips within your dashboard. My Product Listings-takes you to all your resources where you can immediately make quick or longer edits/upgrades to your resources. This is also where you can select/change your free download that will be on the main page of your store and also where you can select your 4 featured products that will also be shown to your store page front. My Statistics section is where you immediately pull up sales, activity, reviews. You can sort through data by date, amount earned, and also previews and download totals. My 1st Moving Quote Box! I never said I was an artist! What I have grown into! Your head and heart are now aligned. You have your vision, your brand, and all the tools to build your dream store! Your store is open, but now comes the hardest part....getting people to believe in you and your store. I also work as realtor(referral agent) for Weichert and I heard a quote when I began that journey in 2007. "People buy people, before they buy houses." The same concept applies with this. Your potential followers/buyers need to buy what your store stands and they will feel if your mission is sincere or not. The goal isn't to make a sale one time and for the person to never come back, it is to make them feel and be part of your goal and to give them a positive experience that lasts long after the sale. That is what I aim for with every person that stumbles across my store and site. I want them to be part of meaningful movements that empower them! Enhancing the Health and Physical Education profession. Teaching/Guiding/Helping Health and Physical Educators. Sharing powerful and honest information regarding health, wealth, and personal empowerment that I have learned. What movements do you want to invite others to be a part of?